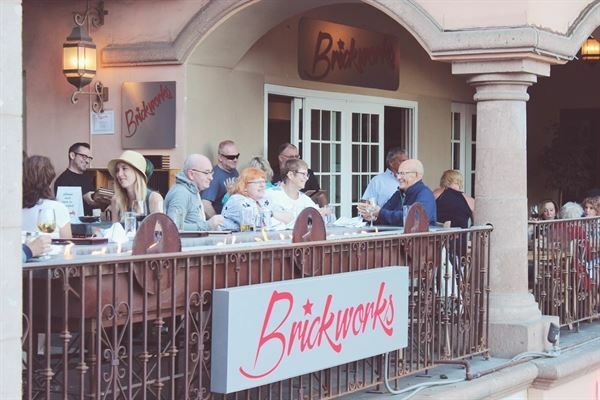 Brickworks is located at Palm Springs, CA. Build an interesting restaurant in an expansive second floor space that includes outdoor seating in historic Downtown Palm Springs! The match experience takes place in an engaging atmosphere designed and custom-built by the partners themselves. They invite you to explore an array of features and decor made from rustic stone, distressed metals, finished woods and vintage brick. Brickworks was designed to offer a number of different choices in planning your event. The menu is equally divided into two parts, the first features incomparable thin crust pizza. The second is bistro menu, consists of a wide selection of chef-driven entrees also provide catering service for any event. Toast your guests with a delicious infused martini on our outside patio or spread out in our spacious and inviting dining room with communal tables and booth seating! Want more privacy? Not only is balcony seating available, they also have two semi-private rooms from which to choose.